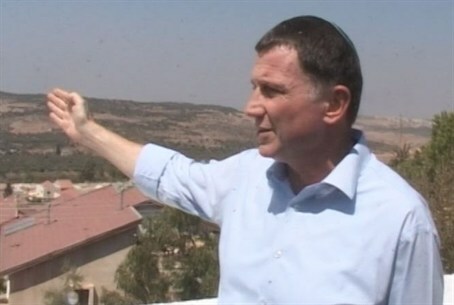 Minister Yuli Edelstein tells foreign journalists that the option to annex areas of Judea and Samaria is "on the table". Minister of Information and Diaspora Yuli Edelstein participated Tuesday in a briefing to dozens of dozens of foreign journalists organized by the GPO in the community of Beit Arye in Samaria. During the briefing Edelstein clarified that the option to annex areas of Judea and Samaria is on the table if the Palestinian Authority goes through with its unilateral statehood bid. Edelstein said that evacuating the so-called “Israeli illegal settlements” in Judea and Samaria would not lead to peace and reminded of the 2005 'disengagement' from the Gaza Strip and the expulsion of Gush Katif residents from their homes. He reminded those present that not only did this move not bring about peace, but resulted in countless terror attacks (the latest one having just recently occurred near Eilat) and the firing of missiles and rockets at Israeli civilians.